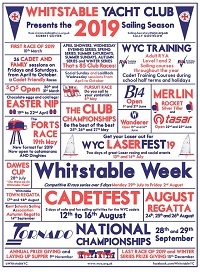 Superb sailing - It is not by chance that Whitstable was one of the earliest places where sailing developed as a sport, nor that it has bred a number of Olympic competitors. Situated at the mouth of the Swale estuary, the sailing waters are only directly exposed to severe winds from the North East. Shallow sandy flats for miles all round and the Street (a one mile long bar stretching out to sea on the East) keep the waves down . These also reduce tidal flow across the bay. This geography makes Whitstable uniquely well placed for long distance events and cruising in cats or dinghies. Sailing school - WYC is a rarity. 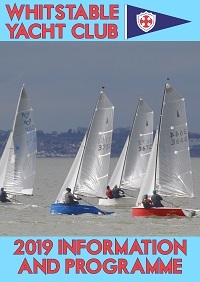 It is a club with its own integrated RYA Recognised Training Centre. Thinking of sailing, windsurfing or another Watersport, but not yet committed? Talk to us to find out if sailing is for you, which boat is for you, if this is the place for you and if we are the people for you. Take your chance to try anything from beginners boards to advanced asymmetrics. You will be surprised how quickly you can feel at home here. Sixty minutes from London - WYC is easily accessible for those living throughout London and the South-East. Whitstable is just 60 minutes drive from the fringes of London, and only 45 minutes from the M25 and Dartford Tunnel so it . In addition Victoria or Cannon Street train stations are less than 90 minutes, including the 10 minutes walk from the club to the railway station. For visitors from abroad, Whitstable is around 45 minutes drive from the ferry at Dover or the Channel tunnel exit. Socialise throughout the year - We party at least every month! Starting with New Year, then on to Championships, Forts Race, Whitstable Week or other excuses throughout the sailing season, before wrapping it up with a succession of Laying-Up Suppers for different tastes and ending with the traditional Christmas celebrations. We pride ourselves in being one of the few sailing clubs whose bar is open during drinking hours throughout the week. Somewhere to escape - You can use Whitstable as your base if you simply want to get away from it all. Just potter along the shore if you wish, drop in at nearby clubs and pubs, cruise up the Swale, round Sheppey or sail over to Southend. It is all doable in a day and whenever you come back, you know you can get ashore at any stage of the tide. Afterwards you can relax in the club, admiring the sunset that Turner made famous. Support services nearby - To meet your sailing needs there are specialist services within walking distance, including the Dinghy Store next door, rigging service and sailmaking. For the non-sailor a wide range of antique, clothes and gift shops are just a stroll down the High Street. Gourmets take note; As befits the home of oysters, there are three specialist seafood restaurants in town. Should anything go wrong, the RNLI is literally next door and the Health Centre is only 300 yards away. As for accommodation, you can stay at the club itself, or pick from the local accommodation. If you would like to join WYC, feel free to visit the club and ask for one of the Flag Officers who will be happy to introduce you to someone with similar interests. Ready to join? Get your application form for membership here.